Elevation High Energy Powder is designed to give you a pre, during and post workout boost. Its high levels of carbohydrate provide much needed energy to the working muscles. The addition of Caffeine allows for the sports man or woman to be alert and to improve reactions. 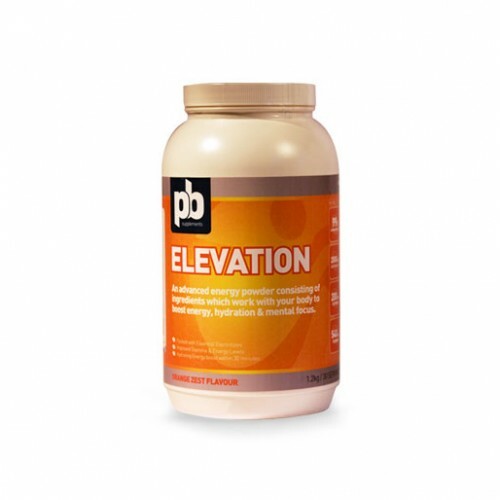 Elevation helps to hydrate the body as it contains sodium, potassium and magnesium. These supplements help to retain fluid and replenish what is lost in sweat where water does not. These electrolytes help to replenish the body’s water supplies and energy sources, essential for any sports man or woman. It will aid those who require an added boost to their training or performance. It will also aid those who require speedy recovery times in high intensity intermittent training and those who perform in aerobic sports. Carbohydrate intake is a fundamental supplement when there is a need to perform at your very best. Other Ingredients: Natural & Natural Identical Flavouring & Natural Colouring from Beta Carotene, Stabiliser (Citric Acid), Contains Natural Sweetener: Sucralose.